Between us, we’ve tried our share of recipes, but could never find the recipe for the perfect chocolate chip cookie. Recently, we were testing recipes and tossing them back and forth. It was getting to the point where we thought we might never hit ‘THE ONE.’ We decided to try a different approach and use the recipes we were testing as a guideline to create our own version of the Perfect Chocolate Chip Cookie. A few tested versions and an ingredient mistake later, and ‘The Perfect Chocolate Chip Cookie’ had been created. And we are proud to say it has been a hit! We knew we had something special as soon as we tried the first hot bite right out of the oven. Our family and friends agreed, and our kids went gaga over them. Joanna’s two-year-old woke up in the middle of the night a few times saying, “I just want da cookie, Mama.” One of Wendy’s friends has a four-year-old and, after trying his first one, he said, “I just can’t help myself. I want more.” And Wendy’s college age son agreed that the cookies were so good that you can’t stop eating them. We always love a good compliment, especially if it’s about something we’ve made, so we loved the feedback from the kids and knew we had a winner. 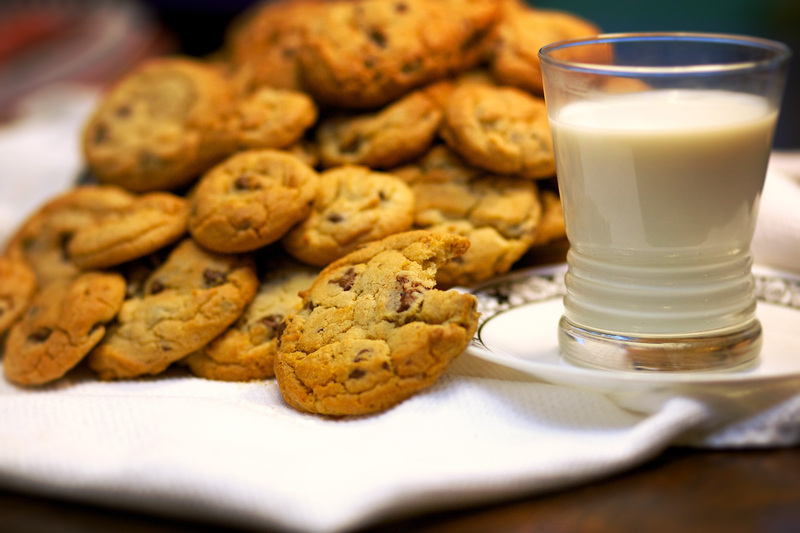 The information and recipe below will help guide you to Chocolate Chip Cookie Heaven. We have tried to be thorough. Please don’t hesitate to let us know if you have any questions. TIPS & TRICKS: (1) Day 2 and beyond (if they last that long), heat up a few cookies in the microwave for a couple of seconds for that right out of the oven taste. (2) Double the recipe below to make a huge batch of cookies that will last a few days. (3) You can substitute chopped up candy bars for the chocolate, but to get the best experience…USE THE CHOCOLATE CHIPS! (4) We like these cookies bite sized and so do the kids. Scoop your desired cookie size and bake for 11 minutes for a soft cookie. Adjust baking time up or down a minute depending on your oven or how soft or crunchy you like your cookie. Serve with a smile and a glass of milk. Hands down the best cookie I ever tasted!